What's the only effective way for Disinfecting Artificial Turf? All the nasty stuff like body fluids, food particles, drinks, bird droppings, and other contamination create a food source for microbes to survive. Disinfectant products kill the existing microbes but leave the contaminants untouched (the food source for the microbes). Concepts like UV exposure, ozone treatment, chlorine solutions, and such do not remove the contaminants either. PSF 110 is your only solution to remove the contaminants from your turf, economically, easily, and very safely. "Q: If I use Turf_, does that mean I never need to clean my field again? A: No. Turf_ creates an antimicrobial coating on turf that continually inhibits the growth of a wide range of microbial contaminants for three months. However, you should still clean and disinfect the field as you normally do to further enhance the effectiveness of Turf_ and maintain field hygiene." Turf fibers and infill will not support microbes even if it's not coated. It's the dirt and contaminants on the fibers and infill that allow the growth of microbes. The organosilane products like above will build up with contaminants and then support microbes, hence their own comments to clean as normal. Why bother with an organosilane product when they tell you that you still need to clean the turf regularly? It's like saying that you can spray dirty dishes with Lysol, bleach, peroxide, or some other disinfectant and it's free of microbes. You are correct for that moment in time. Would you be willing to use that same "disinfected" dish later this week? Me neither, because it is not clean. PSF 110 will biologically clean your turf like no other product available. Biologically cleaning that surpasses all other methods of cleaning surfaces. PSF 110 is an advanced formulation of enzymes specifically for synthetic turf and other sports surfaces. PSF 110 is completely chemical free, non-toxic, and introduces a revolutionary new process of turf cleaning and the decontamination of infectious bacteria, mold, viruses, mildew, and germs. This cutting technology product is the safest available for surface cleaning and removal of these organisms. - Quickly destroys & eliminates infectious bacteria, mold, mildew, viruses, germs. - Performs at high temperatures up to 160˚F. - Highly active energized enzyme concentrate specifically formulated for use on synthetic turf and other sports (indoor and outdoor) high-contact surface areas. - A specially formulated blend of enzymes which have only one basic function to break down, degrade, and digest all organic contaminants. - An all natural plant based enzyme cleanser that penetrates, dislodges, and degrades organic dirt and debris. Removes the "food" that supports the growth of harmful organisms. - 100% safe and biodegradable. - An environmentally safe and natural product. - A must for those facilities requiring "green" products. How you apply a product is as important as the product itself! This patent applied for application sprayer shown above is in actual use. As you can see there is absolutely no material being released into the atmosphere. All of the product is applied to the surface to thoroughly clean and protect the field. The entire surface is being treated since the application is before the wheel tracks and after complete grooming and cleaning. You have to think "painting" the entire surface of every particle and turf fiber to properly cleanse your turf. This takes a properly prepared surface, large volumes of water, higher pressures, properly placed sprayer nozzles, and the right products to get it right. Any other application method, like those shown below, will not be adequate. Here's how to do it wrong! Shown below are a couple competitors improper ways to apply products to turf. Drift is everywhere and who could be standing downwind, a student or an employee? How well do you think the infill is being covered under the wheel tracks? Are the underside of the flat fibers themselves being treated? These are critical factors that are not being addressed. Your field will not be fully protected! You must have it done correctly to protect your athletes, to protect your employees, and to protect your turf investment. Call us now at 888-593-6013 to get the protection you need. Call 419-722-0428 to talk with our General Manager direct. At Professional Sports Field Services we understand your concern about safety and the risks associated with contracting Staph and MRSA on synthetic turf. That's why we developed a complete disinfection and antimicrobial management program to kill Staph and MRSA. As the leader in synthetic turf maintenance, refurbishment, and disinfection services, we pride ourselves in providing the most advanced, thorough application program in the industry. We know from testing and experience that no matter what formula is used on the turf, it will not be effective unless applied properly. Be proactive, don't wait for an outbreak in your athletic program, ask us how we can help protect your team and keep your program in the game. Many years ago we conducted a series of tests on synthetic turf athletic fields to determine the best products and the proper way to apply disinfectants, cleansers, and surface protectants to the turf. We discovered that without correct and thorough application, no product is effective. We use our specially designed sprayers that ensure complete coverage of all surfaces with the best products. We recommend that synthetic turf should be treated at least bi-weekly with heavy usage, monthly in slower seasons, and in the high traffic areas prior to each major event, i.e. in the team and coaches’ box areas, goalie boxes, etc.. Treatment also needs to be applied to the affected area after any body fluids have been removed from the surface. A hand held sprayer should be on the bench for both teams during an event for such needs. Enzymes are not living microorganisms but are a ”living energy” capable of one single action; to break down or digest specific molecules or microorganisms like bacteria, mold, viruses, and germs. Enzymes are a natural part of our world and play an important role in everyday life. Enzymes are catalysts that either start a natural process or accelerate an existing process. Whenever a problem substance, such as bacteria, mold, viruses, and germs, needs to be removed, enzymes are the answer. An enzyme can complete its chemical reaction without being used up or destroyed, leaving the enzyme protein available for yet another reaction. This means that one enzyme molecule can act on many problem molecules. Eventually all the problem molecules are gone and the enzyme stops working. The enzyme, itself, will eventually break down if more problem molecules don’t re-appear soon. Enzymes are very specific in how they perform. Each enzyme can and will break down or synthesize one particular type of compound or problem molecule. Enzymes are proteins, therefore, they are completely biodegradable. They are not toxic to people, plants, or animals in the environment. They are totally harmless if accidentally ingested. Enzymes can be used to replace harsh applications and harsh chemicals like steam and chemical disinfectants. Enzymes are highly specific which means fewer unwanted side effects and by-products in the cleansing process. Enzymes are very safe and gentle on the surface to which they are applied. Why is PSF 110 Sport Surface Cleanser the most superior Enzyme Cleanser available? 1. Our PSF 110 blend contains several different types of enzymes. This provides a broader and more complete cleansing solution than other enzyme products. 2. Enzymes in PSF 110 are effective across a wide range of temperatures. Optimum temperature is between 80˚F and 120˚F. However, PSF 110 can be frozen and maintain the same efficacy when thawed. Best of all, the enzymes are still very effective up to 160˚F. PSF 110 can be applied nearly anytime needed. 3. PSF 110 enzymes are plant derived, 100% biodegradable, and contain all natural ingredients. No worries about allergic or chemical reactions or surface runoff. 4. The PSF 110 proprietary production process results in a more stable multiple enzyme blend with an unlimited shelf life. You can be assured that PSF 110 will be of uniform high performance. 5. The technology that makes the enzymes as well as the final product formulations is proprietary to PSF 110. The enzymes are manufactured in the U.S. by an ISO 9001:2000 registered facility. PSF 110 will always be of very high quality and consistency for effective application and efficacy. To download a brochure for PSF 110 Natural Enzyme Sport Surface Cleanser, click here! You can apply PSF 110 yourself! Go to the "Purchase Products" page to buy PSF 110 for your own use today!!! PSF 110 is an outstanding product for use in locker and weight rooms, wrestling mats, and all indoor surfaces as well. To download a copy of the MSDS for PSF 110, click here. Throughout Western Pennsylvania, staph infections are on the rise among student athletes. A recent outbreak at Mt.Lebanon High School put local districts on high alert. Pine-Richland is working to protect its students from Methicillin-Resistant Staphylococcus Aureus (MRSA), a potentially lethal pathogen caused by hard-to-destroy bacteria. "We need to be proactive," Superintendent Dr. James Manley says. "All of the surrounding school districts are looking to be proactive. We're sharing ideas with each other on how we can make our facilities safer for our students." MRSA can be transmitted by skin-to-skin contact or by sharing athletic equipment, towels, razors and other personal items. The infection resembles a spider bite and has been known to cause pneumonia. Buildings and Grounds Director Gary Zang and his staff have disinfected the stadium locker rooms and weight rooms, uniforms and equipment by using a fogger system, which quickly and evenly distributes a bacteria-killing solution. The same procedure will be performed on the high school, middle school and Richland Elementary locker rooms. 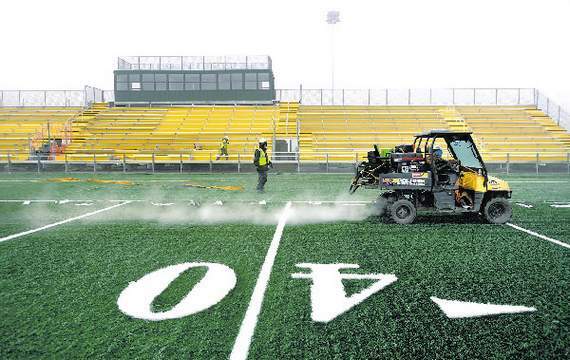 The district also hired Professional Sports Field Services (PSFS) to spray the stadium field with PSF 110, a synthetic turf cleanser that is effective against a broad spectrum of bacteria, including MRSA. Brian George, sales and marketing manager for the Ohio-based company, recommends spraying at least once a month during football season or other high-activity periods. Zang's crew will be able to apply more applications if necessary. Before the disinfectant is applied, the field is cleared of any foreign matter such as dirt, trash or leaves. The surface is broomed so that all the turf fibers stand straight up. Afterward, while the equipment is being disinfected, the field is given 10 minutes to dry. Players can then get back in the game without any side effects. "The bacteria issue for synthetic fields is becoming well known by athletic directors and facility maintenance people," George says. "[Athletic Director] Clair Altemus at Pine-Richland was very concerned and wanted to make sure all the athletes on his field were safe from any bacteria." While high-tech solutions are being used to combat MRSA, the simple act of hand washing is also effective in preventing an outbreak. District cafeterias already boast hand-sanitizing soap dispensers and more are being installed throughout the buildings. Hance Elementary school nurse Terry Wentz, CRNP, says district health professionals are working toward a unified elementary program on the benefits of clean hands. "Hand washing is the key to disease prevention," she says.